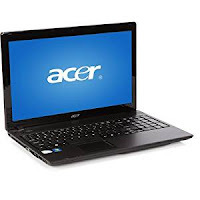 I bought my Acer Aspire 5336-2615 laptop about six years ago when my old tower went on the fritz. It's been my home office, on my desk, main machine ever since. It doesn't travel. Well, it did follow me when I moved across the Atlantic from eastern Pennsylvania to the south of France. But it's not used as a portable. It stays parked on my desk most of the time. I use a tablet when I'm in other parts of the house or on the road. Oh, I do take the Acer downstairs to the router when a direct connection is desirable over my slower WiFi if I have large files to upload. Basically, though, the Acer just sits there. It's been a workhorse for the simple tasks for which it is used. Word processing. Lots. Surfing the internet. Lots. Streaming video and music. Lots. No gaming but it is the platform on which I prepare a two-hour internet radio program every week. That means stitching together two dozen songs or more with appropriate commentary into a single MP3 file using fairly complicated sound editing software and a USB microphone. So it's a busy little beaver. Doubling RAM to 4 GB helped speed things up. 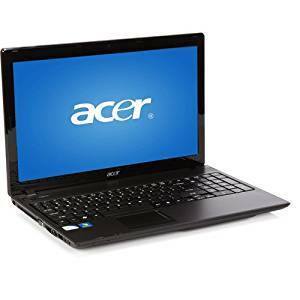 And a 500 GB portable hard drive keeps the Acer's available memory within reason and assures backup in case of implosion. Given an initial price of about $350, I have had no complaints...until recently. The left-side Shift key stopped working. I googled, poked around a bit, and discovered that uninstalling the keyboard and restarting might work. It did. Once. But using the right-side Shift key was a reasonable if inconvenient workaround. Not reasonable, however, was having to use the number pad when several of the number keys quit working. And not having the ( key available at all was simply unacceptable. The interweb agreed. There were no quick hacks. Time for a new keyboard. New keyboards for my Acer are cheap as chips, even in France. You have to be careful though. My first search resulted in an AZERTY keyboard with the key tags in French. But QWERTY keyboards with tags in English are readily available. Then I made a mistake. I watched a YouTube video showing how to replace an Acer keyboard. I thought that it was specific to my Acer. It wasn't. Or maybe it was but the presenter was simply an idiot. Bottom line? It advised pulling the damn machine just about completely apart. Whoa. Not for me. I'm a reasonably handy guy. I can put together complicated IKEA furniture that will function perfectly without leaving any leftover parts on the floor. But I will not gut my computer on my own. Fortunately, a young lady lives just down the street whose car carries signs announcing her computer repair business. I called. She came. I'll call her Mlle D. Yep, the keyboard needed to be replaced. Up we went on amazon.fr. We made certain that we ordered an English-language QWERTY keyboard for the right model. A few days later, the keyboard having been delivered, I called again. Twenty minutes later, we were sitting together at the kitchen table. I watched as Mlle D opened a toolkit not much bigger than a couple of decks of cards, one on top of the other, filled with tiny tools. She attached a small screwdriver blade to a multi-purpose handle. And then, after taking out the Acer's battery, she proceeded to pry off the keyboard. Seriously. She pried off the keyboard. Carefully. But she pried off the keyboard. Simple as that. After pulling off the keyboard, disconnecting the cable from the motherboard, and attaching the new keyboard's cable without snapping the new keyboard in place, Mlle D reattached the battery to make certain that all was in order. It was. Snap after careful snap and the keyboard was installed. The price? Embarrassingly low. After all, she explained, you're a neighbor and it only took 20 minutes. Sometimes, even when life throws you a curve, you can still hit a single. You can watch a video of the right way to do it HERE. I wish that I'd seen it in the first place. The presenter claims that his website contains a searchable database that includes videos for many popular models.